"Backgrounds and Contexts" is divided into three sections, each of which includes a concise introduction by Michael Gorra that carefully frames the issues presented, with particular attention to As I Lay Dying's place in Faulkner's literary life. "Contemporary Reception" reprints American, English, and French reviews by Clifton Fadiman, Henry Nash Smith, Edwin Muir, and Maurice Coindreau, among others, along with Valery Larbaud's never-before-translated preface to the first French edition of the novel. "The Writer and His Work" examines Faulkner's claim to have written the novel in six weeks without changing a word. It includes his comments on the book's composition along with his later thoughts on and changing opinions of it, sample pages from the manuscript, his Nobel Prize address, and the little-known short story in which he first used the title. "Cultural Context" reprints an essay by Carson McCullers and an excerpt from James Agee's Let Us Now Praise Famous Men along with other materials that address questions of Southern Agrarianism and the Southern grotesque. 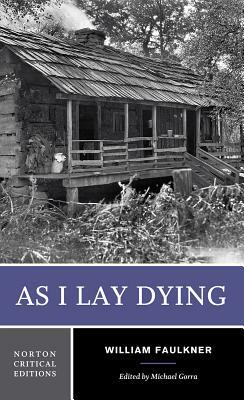 "Criticism" begins with the editor's introduction to As I Lay Dying's critical history and scholarly reception. Eleven major essays are provided by Olga W. Vickery, Cleanth Brooks, Calvin Bedient, Andr Bleikasten, Eric Sundquist, Stephen M. Ross, Doreen Fowler, Patrick O'Donnell, Richard Gray, John Limon, and Donald M. Kartiganer. A Chronology and a Selected Bibliography are also included.